Need vitamin B to ward off alzheimers? Eat virtuous bread. In her book Let's Eat Right to Keep Fit, published in 1954, Adele Davis, an American nutritionist had this to say about the B vitamins: "In fact, there are only four good sources of these vitamins: liver, brewers' yeast, wheat germ, and rice polish. A few foods are high in one or two B vitamins, but to obtain our daily requirement of all of them from such foods is impossible." The few foods about which she spoke include leafy greens, meat, seeds, and nuts. Although Adele Davis has her detractors, the information on sources of vitamin B is correct although we now know that the germ of any grain is high in all the B vitamins so we do not have to be limited to wheat germ alone. Spelt and rye, for example, will do just as well. The conclusion we have to draw from Adele Davis' work in the fifties is that bread made of whole grains is one of the most important foods available to us. Switching to whole grain bread is a good first step. However, it is important to understand that the majority of the bread on offer is made with flour that is industrially milled, and industrially milled flour has some limitations. In the industrial milling process, grain is ground by metal rollers that both heat up the grain and put it under enormous pressure, thus destroying some of its nutritional value. Further, the bran and the germ are separated out as the grain is milled, in order to make it easier for the miller to package white flour which is by far the majority of the flour sold in the West. To produce brown or whole meal flour, the bran and germ are added back in again in particular proportions. However, the process of "adding back in again" coming where it does, does not guarantee that flour is actually whole meal. 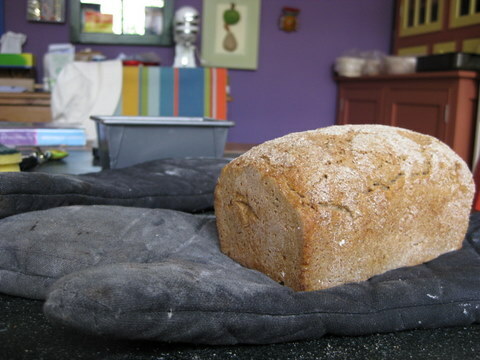 If you want to get the full vitamin B value out of a whole meal loaf, you should buy bread that is made with (or bake bread with) whole meal flour that has been stone ground. Stone millers put grain in the top of the mill and collect flour at the bottom - bran, germ, and all. This guarantees that the whole meal flour they sell contains all of the goodness that the bran and germ have to offer. Even the white flour produced by stone millers is more nutritious than industrially milled white flour both because it is milled under lower pressure and temperature and because it has had the opportunity to absorb some of the essential oils from the bran and the germ before they are sieved out. If you want more vitamin B to make sure your brain does not shrink, eat liver, brewers yeast, whole grains/grasses (e.g. : rice), or supplements. Eating good bread is a convenient way of getting the B vitamins from whole grains - and although it is more expensive than sliced bread in a bag, it is a great deal cheaper than supplements. B12 is only found in foods of animal origin such as eggs and fish. So strict vegetarian/vegan diets can be almost devoid of B12, even when eating good bread which I agree is an excellent way of getting the B vits from wholegrains + yeast. Hi there savvy cook! IN fact cannot veg and vegan diets be devoid of a lot of nutrients unless the veg or vegan in question has really studied the issue? B vits and protein spring to mind but also certain things that are found in dairy and enable good bacteria to flourish so that certain nutrients can even be absorbed...tricky if you are vegan. I don't know the ins and outs (being a carnivore) but I guess veg and vegans need to be careful? That is an amazing comment. Thank you so much for responding.